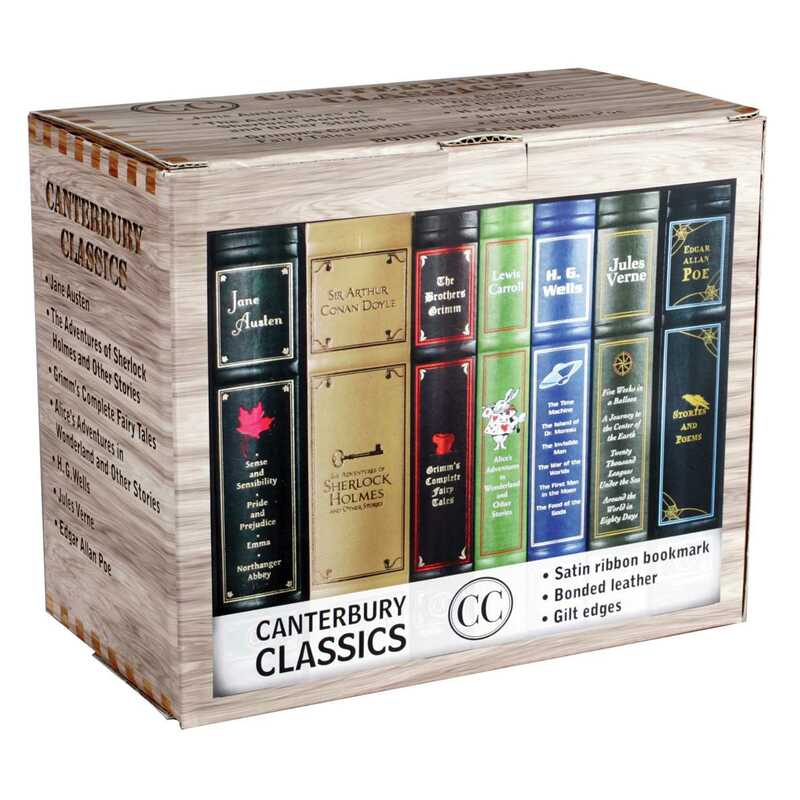 Seven volumes of adventure, fairy tales, mysteries, and more! The haunting stories of Edgar Allan Poe, classic fairy tales by the Brothers Grimm, and futuristic adventures by H. G. Wells and Jules Verne are all included in these seven deluxe volumes of the most popular classic literature money can buy. Adults and children alike will fill many an afternoon enjoying the social satire of Jane Austen, whimsical stories of Lewis Carroll, or solving mysteries with the mastermind Sherlock Holmes. Each book is beautifully finished in bonded leather with gilt edges—perfect to start your home library classic literature collection. The ribbon bookmark will ensure you never lose your place! English author H. G. Wells is best known for his work in the science fiction genre. He was also a prolific writer in many other genres, including contemporary novels, history, politics and social commentary, even writing text books and rules for war games. He was born on September 21, 1866 and died on August 13, 1946. Jacob and Wilhelm Grimm collected and published Germanic and European folk and fairy tales during the early to mid 19th century. Some of the world’s most classic and beloved stories have been published by them, including “Rumplestiltskin,” “Snow White,” “Sleeping Beauty,” “Rapunzel,” “Cinderella,” “Hansel and Gretel,” and many more. Born on January 19, 1809, Edgar Allan Poe has become synonymous with writing described as mysterious and macabre. Also credited with originating the detective-fiction genre, Poe is considered part of the American Romantic Movement. A very celebrated poet, short story writer, and Gothic novelist, Poe died in 1849. French writer Jules Verne (February 8, 1828 - March 24, 1905) pioneered the science fiction literary genre. He published many plays, essays, short stories, and poems during his lifetime, but is best known for Twenty Thousand Leagues Under the Sea, Around the World in 80 Days, and A Journey to the Center of the Earth. Today, he is one of the most translated authors in the world.